Numbers can sometimes help me think about textile history from a slightly different angle. 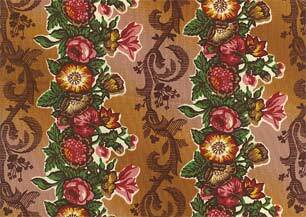 The 1840s were a time of rapid advances in textile printing. (New printing machinery as well as dyes) Designs were often 'over the top'....because technically it was now possible. Merchant's Wife by Terry Clothier Thompson for RJR Fabrics beautifully illustrates this phenomena. Let's do a floral garland...in between add a scroll.....then put both on top of a diagonal ombre. WOW! Here is the statistic....."1840...an estimate of hand versus machine printing of fabrics in Great Britain per day was 168 yards ( hand) as against 5,600 to 14,000 yards by machine". Quote from "A Pieced Quilt" by Holstein.